Today, acupuncture, in one form or another, is practiced in dozens of countries by thousands of acupuncturists on millions of people and their animals. According to the National Institutes of Health, in the U.S. alone, there are currently more than 10 million adults that have used acupuncture at some time in the past, or are using it currently. People go to acupuncturists for treatment of AIDS, allergies, arthritis, asthma, Bell's palsy, bladder and kidney problems, breast enlargement, bronchitis, colds, constipation, cosmetics, depression, diarrhea, dizziness, drug addiction (cocaine, heroin), epilepsy, fatigue, fertility problems, fibromyalgia, flu, gynecologic disorders, headaches, high blood pressure, hot flushes, irritable bowel syndrome, migraines, nausea, nocturnal enuresis (bedwetting), pain, paralysis, post traumatic stress disorder, PMS, sciatica, sexual dysfunction, sinus problems, smoking, stress, stroke, tendonitis, vision problems, and just about anything else that might ail a human being. So what is it? As one of the oldest healing practices in the world, acupuncture is a family of procedures that originated in Traditional Chinese Medicine (TCM), which is based on the concept that disease results from disruption in the flow of qi and imbalance in the forces of yin and yang. As part of TCM, acupuncture aims to restore and maintain health through the stimulation of particular points on the body (called acupoints) by a variety of techniques, involving the shallow insertion of needles through the skin at acupoints along primary channels and meridians that crisscross the body. Traditional Chinese medicine says that good health is associated with the balance of qi, an energy force that flows through the body. Qi can be hindered or helped by yin and yang--opposing forces that, when balanced, work together harmoniously. 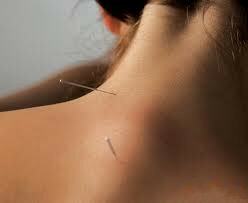 Acupuncture is intended to remove blockages in the flow of qi to keep yin and yang in balance. There are many different kinds of acupuncture, with different kinds of needles, different insertion points, different techniques, and the use of various accompaniments such as electricity or moxibustion. 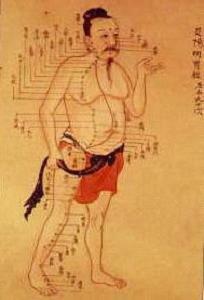 In China, acupuncture is used to alleviate postoperative pain. Medical experts believe that inserting needles into the body at precise points can stimulate nerves that cause the brain to release its natural pain-killing chemicals. Experiments have proved that acupuncture can strengthen the central nervous system and especially reinforce the action of the sympathetic nervous system and cerebral cortex which control all the tissues and organs of the human body. For instance, acupuncture can regulate heartbeat, body temperature, blood pressure and respiration; relieve muscle spasm and numbness; treat disorders of exocrine and endocrine secretions; and promote secretion of the glands. One of the key benefits of acupuncture emerging from various studies is that it has few, if any, side effects. Relatively few complications from the use of acupuncture have been reported to the Food and Drug Administration (FDA), in light of the millions of people treated each year and the number of acupuncture needles used. In the United States, acupuncture has already been considered part of complementary and alternative medicine (CAM). The U.S. National Institute of Health has endorsed acupuncture for treating certain types of nausea, vomiting and pain, such as the nausea sort of sickness that a patient suffers when given an anesthetic for surgery, or treated with chemotherapy, or the nausea and vomiting that accompanies pregnancy, or postoperative dental pain. We have come to the very clear-cut decision that treatment under these circumstances really works. It is clear that today many people around the world believe acupuncture is an effective medical treatment for such a vast variety of disorders. This belief in acupuncture's effectiveness is based on experience and scientific experiments. However, one principal concern in evaluating acupuncture's effectiveness has been the so-called placebo effect-the possibility that beneficial outcomes derives not from the treatment itself, but from the patients' belief that it works. Medical experts have already implemented studies proving that there's physiological mechanism of acupuncture that goes beyond belief. Acupuncture is also widely employed in easing cravings and withdrawal pain of heroin addicts. Forty percent of the drug courts in the United States use acupuncture as part of their therapy. In the Miami system alone, there are approximately four hundred treatments per day. Some countries such as Sweden, the doctors have achieved success with acupuncture in treating the effects of stroke. Those stroke patients getting acupuncture along with physical therapy did a lot better than those getting only physical therapy.